Give us some background about yourself as a writer and why it was important for you to attend a residency at this point in your career. I am writing a book around the subject of work, which shapes people’s lives in profound and often unexamined ways. My “day job” in the technology field is demanding which means that I work on the book in leftover time, so progress is steady but slow. The residency came at a particularly opportune time — I was about 80% finished with the manuscript, and what I needed most was dedicated time to flip the priorities and put my creative project first in order to accelerate the time it was taking and bring the work to fruition. How did you structure your time during your writer’s residency? I would focus on writing one chapter each week, and I also spent a day every week working on submissions of earlier pieces so I could get some of my other work out there. Starting early worked best for me. If I got in a good morning’s work, I felt good about the day even if I didn’t accomplish anything else. I often kept going through the afternoon or evening. Working primarily in the morning also allowed me to enjoy a siesta in the heat of the afternoon. 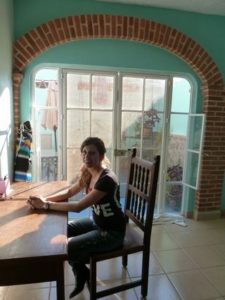 How did you hear about 360 Xochi Quetzal and why did you choose to apply to a program in Mexico? I heard about 360 Xochi Quetzal via the Alliance of Artists Communities (http://artistcommunities.org/). I was starting to apply for residencies, and thought the setting sounded perfecta: a place to disconnect from the usual daily distractions and also a rich place to experience. I used to go to Mexico a lot, and had always wanted to spend more time there, so it was an optimal combination. 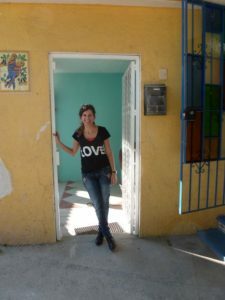 Your residency was in Chapala, a small town in central Mexico. Tell us about how you found your way around and explored the town. Exploring new places is one of my favorite pastimes. I’ve been fortunate enough to travel to many parts of the world, but it is different when you live someplace. I noticed that carrying groceries home makes a person look like a local – when I did that, people stopped looking at me like a tourist. Chapala is a small enough town that, after awhile, people recognized me and I recognized them. I got to feel a part of the place in a way that I hadn’t anticipated. I never had much of a plan as far as finding my way around – I just ventured out every day and little by little, figured out where things were. Some of my favorite spots in Chapala were the Centro Cultural, and the trail up to the top of the hill overlooking the town. I also developed a habit of visiting one particular ice cream vendor – I really miss that! What can you share about your writing process during your residency? What ideas were you exploring? How did this time focused time influence your work and thinking? I am used to writing in short bursts, and the time in Chapala was the opposite. I got used to working in a more continuous way, being more immersed in the subjects over the course of a day or a week. Usually I’d write for awhile and then sometimes I’d go out walking and think about what I was doing, or sometimes I’d do some research for a chapter. So even when I wasn’t writing, I tried to direct all my activities toward the particular piece I was working on. In a way, it felt odd to be working on this book about a fast-paced, high-tech lifestyle in the middle of a town where that lifestyle doesn’t exist. I think (I hope) that might have ended up making some of the writing more meaningful because I was very aware of the context of the larger world, even while I was examining what might be considered a particular American subculture. What were some of the highlights of the residency for you? What parts were hard for you? One of the highlights was getting up in the morning, having breakfast out on the patio, and then sitting down to write, as if this were my job. I can think of so many mornings where I’ve wished I could do just that. Getting to live the life of a writer was really satisfying, even though there were plenty of frustrating writing days. Restoring myself to a natural sleep schedule was also great, and I loved meeting so many interesting people. The first few days were absolutely the hardest part for me, to be taken out of a routine and suddenly dropped into a new life. I was assailed by doubt about what I was doing and whether it was a good use of time, whether I could actually accomplish what I was planning to accomplish. 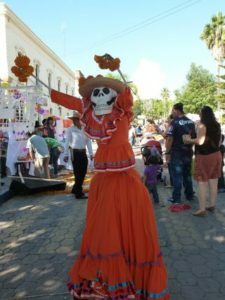 I guess you’d call it culture shock, but by that I don’t mean the culture of Mexico, I mean being in a totally unfamiliar state where every minute wasn’t already packed with demands that told me what I had to do next. It took me a week or so to get acclimated to that, to get my bearings and start to feel somewhat normal. How did the natural surroundings influence or affect your work? I had a favorite spot by the lake at Parque de la Cristiania in the morning when there weren’t many people around. These moments were all about serenity — listening to the wind in the trees, following the birds in the marsh, watching the fishing boats on the lake. Although my book isn’t focused much on nature, these times were lovely and nourishing. Some writers come to a residency with a particular creative game plan. Others just arrive open to whatever inspires them at the moment. How did you approach your residency and how did your creative time compare to what you anticipated? For me, this was precious time, and I wanted to make sure I used it well. I had a pretty specific game plan which I didn’t follow exactly, but having it helped me become more productive. I don’t think I would have gotten anywhere just being open to anything, but then I had a very concrete goal in finishing the book. Of course, plans are always somewhat ambitious, so I didn’t finish everything I wanted to, but I got close, and I definitely left satisfied with what I accomplished. What else can you share about your residency experience? Were there any surprises? I really appreciated my fellow resident Yuki Shiroi (see Yuki’s interview on our website), who shared the adventure and painted some amazing murals. Every day in Chapala was a surprise, really. I would love to come back.